Dubbo's new 21st Century School. Looking for a new approach to your child's education? In 2018 we launched with Years 3-6. In 2019 we added Year 7, and will continue to grow with our advancing students through to Years 11 and 12. It is not enough to teach our children facts, we need to teach them to be confident with their individuality, how to manage feelings, manage friendships and solve problems. We emphasise community engagement, Design Thinking and student-driven learning, as a catalyst for academic rigour. Students graduate armed with the skills to compete in a technical world. The capacity to take responsibility and self-manage learning and behaviour is a fundamental life skill. We implement a dress code that promotes individual choice, provides a reusable wardrobe, and eliminates expensive uniform fees. We allow students to drive their learning through by student centred pedagogies such as Visible Thinking, Challenge Based Learning and Guided Inquiry. To be successful in their future professions children will need skills to assess their environment, analyse a situation, and design solutions to address complex problems. This means less rote learning and instead teaching our students to be problem solvers. Test scores play a large role in today's educational system but high test scores do not necessarily translate to a learner who can conceive creative solutions. We inspire our students to become creative producers that will contribute new ideas that add value to our society. Our students are active citizens within our community and make positive contributions to the world. They also learn effective digital citizenship to understand how to navigate and reside in a technical world. Communication is a foundational skill that transcends subject areas. It is crucial that students become effective interpersonal communicators and understand the evolving paradigm of communicating using technology. STEAM (Science, Technology, Engineering, the Arts and Mathematics) is baked into our curriculum. All students have their own Chromebooks and access to online virtual classrooms where all assignments and class-issued work is stored on Kiddom. 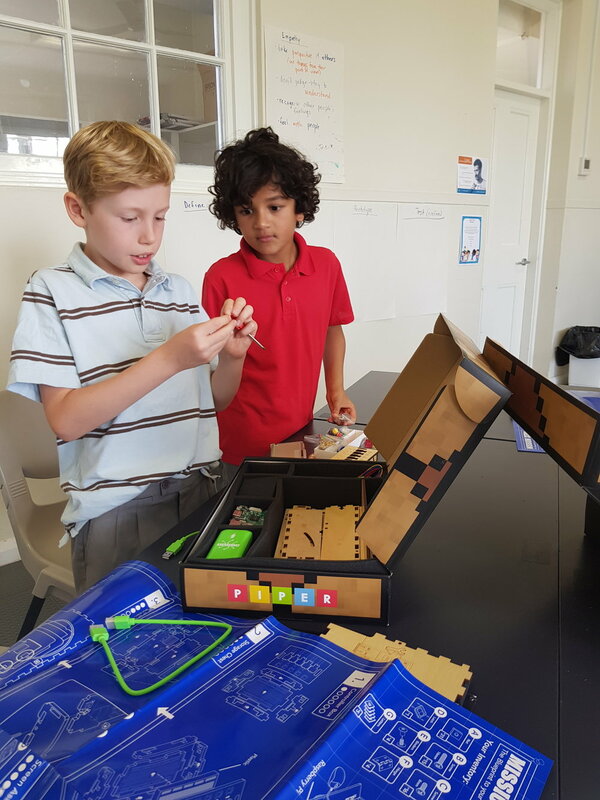 In STEAM, students build a computer and then learn about electronics with Raspberry Pi edition of Minecraft, using amazing Piper kits. We spend the first 15 minutes of each morning learning foundational technology skills like touch typing, and supplementing Mandarin lessons with Duolingo. Each Academy student has an Individual Learning Plan (ILP) developed in partnership between teacher, student and parents. Parents track student progress online and can see real time updates on progress through the Literacy and Numeracy continuum.. Individual Learning Plans allow students to work at their level regardless of their age and foster a sense of responsibility and empowerment for their learning. In addition to our outstanding, levelled classroom teacher instruction in core subjects Maths, English, Science and HSIE, we engage local experts and leaders in our community to teach our students art, language, music and drama. Tinker Time is unique to the Academy. It is a student-directed design thinking project that occurs one session a week at our school. Students choose a personal, school or community issue they want to address and use Design Thinking to research and implement a solution. It is a chance for students to apply their learning in the wider community and for businesses and community groups to come together to engage the students in real-world learning.